"These cute Easter cupcakes are decorated with chocolate buttercream and chocolate sprinkles to make a nest, with each nest holding three chocolate eggs in the centre. Kids will love to help make these Easter cupcakes!" Preheat the oven to 375 degrees F (190 degrees C). Grease 18 muffin cups or line with paper liners. Combine 1 cup plus 2 tablespoons flour, 1/2 cup butter, sugar, eggs, and 2 tablespoons cocoa powder in a bowl. Beat with an electric blender until batter is evenly blended. Spoon batter into the prepared muffin cups, filling each 3/4 full. Bake in the preheated oven until tops spring back when lightly pressed, 10 to 12 minutes. Cool in the tins for 5 minutes. Transfer to a wire rack and let cool completely, about 20 minutes. While the cupcakes are cooling, make the buttercream. Beat 3/4 cup butter in a bowl with an electric blender until light and fluffy. Add 1 1/2 cups cocoa powder and confectioners' sugar alternately with 1/2 cup plus 2 tablespoons milk. Add vanilla extract. Beat frosting until it has a spreading consistency, adding more confectioners' sugar or milk as needed. Transfer chocolate buttercream to a piping bag with a star tip and pipe a round nest onto each cupcake. Sprinkle nest with chocolate sprinkles and place 3 mini chocolate eggs into each nest. 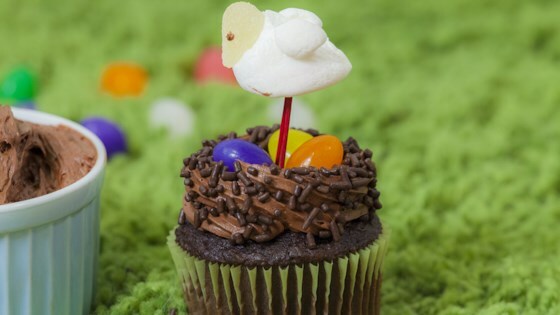 Watch how to create these adorable nest cupcakes for Easter! In a pinch, you can start with store-bought chocolate cupcakes and just concentrate on the fun of decorating!